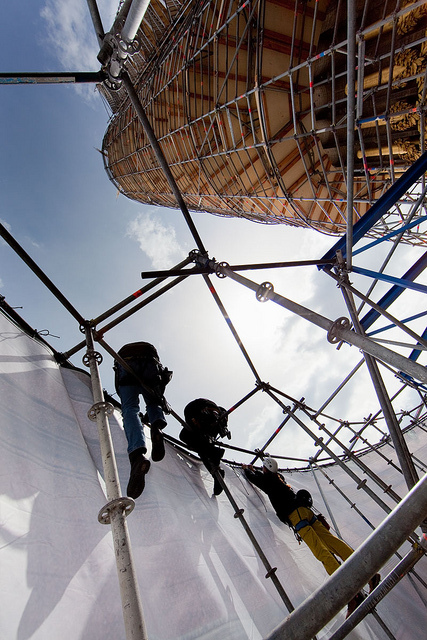 In response to what it describes as “an alarming increase” in worksite injuries and fatalities related to communication tower activities, the federal Occupational Safety & Health Administration (OSHA) recently issued a memorandum for regional administrators. Intensified upgrades to cellular infrastructure (to cite an example from a few years ago, preparation to introduce 3G service) are likely contributing to the toll: 14 incidents in just a few months of 2013, a total greater than that of the previous two years combined. According to an article on the public interest journalism site ProPublica.org, a joint investigation the site conducted with PBS’s Frontline found that 50 tower climbers died onsite in the U.S. between 2003 and 2011, a staggering number for an industry that comprises a mere 10,000 or so workers. Based on these figures, communication tower work is 10 times more dangerous than construction work. But because the cell phone carriers contract out this type of work to companies that then often subcontract it to still other companies, up till now OSHA’s ability to track tower injuries and deaths has been severely compromised. In addition, time and budget pressures mean workers often disregard safety measures in order to complete jobs more quickly. OSHA is taking action to combat the trend via outreach and enforcement. Area offices have been advised to inspect local sites where communication tower work is taking place. The administration will also monitor data gathered from investigating incidents at such sites. Ensuring employers comply with fall protection measures is one of the main focuses of the initiative. The California Occupational Safety and Health Administration (Cal/OSHA) offers a useful quick-reference guide to help your employees work safely and to check your compliance with Title 8 regulations.